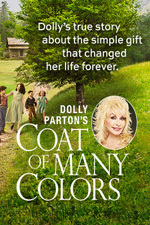 Based on the inspiring true story of living legend Dolly Parton's remarkable upbringing, this once-in-a-lifetime movie special takes us inside the tight-knit Parton family as they struggle to overcome devastating tragedy and discover the healing power of love, faith and a raggedy patchwork coat that helped make Dolly who she is today. One presumes this movie is too earnest and heartfelt a story to get any serious consideration at Emmy time, and that's a shame. It's a warmly written, beautifully shot, and well acted picture. The focus is the story of the song, of course. While Dolly covers it all in under three minutes on the record, the movie runs two hours. The extra time isn't just padding. The introduction of the family, the setting of the scene, and the time spent showing the trials and tribulations of life in the mountains in the '50s round out the film nicely. Even with the pain and heartache they suffer, you come to love this family and wish the story would never end. Alyvia Alyn Lind especially shines as Young Dolly, but Jennifer Nettles, of Sugarland, Ricky Schoder, and Gerald McRaney are are all excellent as well. I also think Hannah Nordberg deserves special praise for her portrayal of Judy Ogle, who became Parton's lifelong friend. She effortlessly emotes the self-conscious intensity of a sensitive young person's overtures of friendship. I feel like the movie manages to capture the real spirit of Appalachia. It resonated deeply with me. I laughed out loud when Young Dolly rode up to the school on her horse. It reminded me of stories of my business partner riding to church in the Georgia hills on Sunday mornings after camping out Saturday night. They wouldn't start the first hymn until they heard the hoof beats of her galloping up because she'd be in trouble if she were late. She didn't figure it out for years. In any event, despite its religious overtones, this movie pleased even a bitter and jaded apostate like me. I'm predisposed to love anything even tangentially related to Dolly Parton and side-eye anything tangentially related to being a movie about faith, but damn did this win me over. I didn't realize until this morning that Jennifer Nettles wasn't a "real" actress, and that's sort of representative of the whole thing: it was all just very nicely done and overcame almost all of my preconceived notions about what wouldn't work. I hope that this gets another release soon because I cannot wait to buy this on DVD for my grandma. I'm a big Dolly fan, but I didn't watch this last night primarily because of the religious themes. After reading this post this morning, though, I did watch it tonight on On Demand, and I really agree. I'm areligious, but this movie, even though the religious elements ran throughout, came across as a story about this family and this community, rather than as a religious movie, if my distinction makes sense. And I definitely agree with the praise for the main actors -- I did know who Jennifer Nettles was and I love her music, but I was really impressed with her here. Anyway, thanks for posting about it, because I probably wouldn't have gone back and watched it otherwise. Just wanted to come back and say that I also was very impressed with Rick Schroder. I still think of him as Ricky and I have a hard time remembering the great adult roles he's done, but he pulled off being both stern/reserved and feeling/loving. His character could have easily come off as 2-dimensional, but he didn't. While it's mostly a promotional video for the Georgia Film, Music, and Digital Entertainment Office, this "behind the scenes" video does show some interesting aspects of the making of Coat of Many Colors.